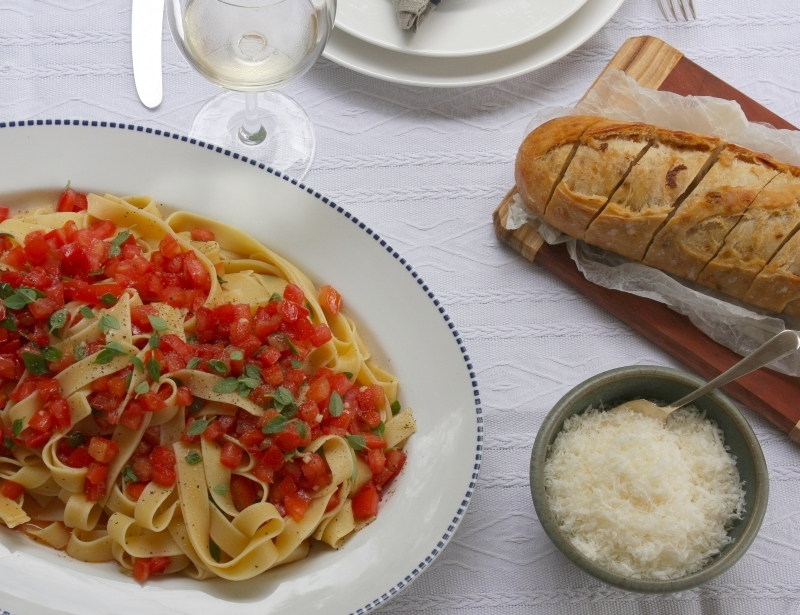 This tomato pasta is a little bit unusual in that the tomatoes are not cooked but rely on the fresh, hot pasta to warm them and release their flavour. It is a wonderfully fresh and light dish and the combination of tomatoes, garlic, olive oil and basil is a winning one. It’s perfect for Sunday lunch and at our place we serve it with a crisp green salad and some crusty, warm bread. The bread is almost essential as it is perfect for mopping up the leftover pasta sauce. My daughter is a wonderful helper in the kitchen, and enlisting her services to help prepare the tomatoes not only made the dish quicker to prepare, but was also lots of fun for both of us. Only the ripest and reddest tomatoes will do for this dish – try to get vine-ripened ones for the most luscious results. Cut the tomatoes in half. Scoop out the seeds and the fleshy part of the tomatoes and place in a seive over a bowl, to let the juices drain through. Cut up the rest of the tomatoes into small cubes. It’s worth taking a little time to do this neatly as it does make the final result look much prettier. Put the cut tomaotes, garlic, torn basil leaves, sugar, salt, olive oil and a really good grind of black pepper into another glass bowl and add the juice that has drained from the scooped out insides. Let the tomatoes sit for the flavours to combine and develop. Meanwhile, bring a large pot of lightly salted water to the boil and cook the pasta until it is al dente. Drain well and then add the hot pasta to the tomatoes. 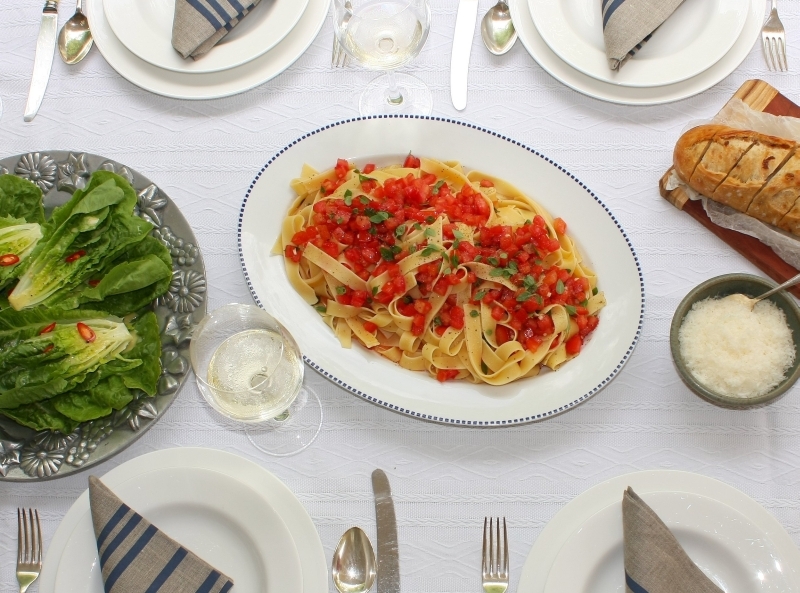 The heat of the pasta will release the wonderful aromas of the tomatoes, basil and garlic. Stir well and then tip onto a large serving platter, making sure that plenty of the bright red tomatoes are on the top. There may be some extra tomato sauce, depending on how juicy the tomatoes are. Carefully drizzle this over the top of the pasta, scatter with the extra basil leaves and then serve. It is best served warm, rather than piping hot. Serve with a good amount of freshly grated parmesan cheese, and another grind of black pepper. Thanks so much! We sat down to eat as soon as my husband had taken the photos. It was our first attempt at a ‘whole table’ shot, and we were pretty happy with it.